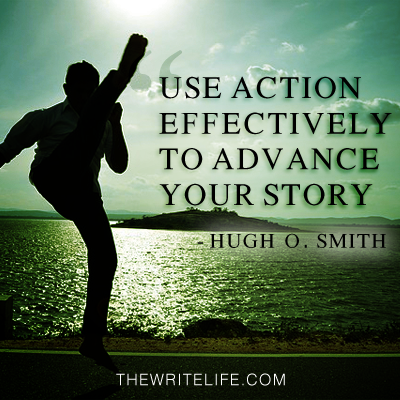 Good writers know how to use action effectively to advance their story. Pulitzer Prize winner Larry McMurtry includes the scene below in his novel Lonesome Dove. It’s a short and brutal scene, but it gives you great insight into the personality of his character, Woodrow Call. The scene also forces the reader to ask questions that enhance the enjoyment of the rest of the novel. Here’s how to solve this conundrum: realize that most authors have not seen gunshot or stab wounds firsthand. I have never seen anyone get shot (thank goodness! ), but there’s nothing stopping me from doing some research. South African novelist Deon Meyer shadows police officers and interviews forensics experts to help him create scenes like this one, from Dead Before Dying. For more information on writing a great fight scene, check out Joanna Penn’s free interview with martial artist and author Alan Baxter, Alan’s book Write the Fight Right, or the How To Write Fight Scenes Masterclass With Alan Baxter. Hugh O. Smith is the author of the books, Willows and Green Eyes and Good Hair and he blogs at HughOSmith.com. You can follow his work on Twitter, Facebook or Goodreads.